Exactly 593 years after King Henry V’s legendary victory, a revisionist conference will be held at the scene of the triumph. Academics will suggest that the extent of the feat of arms was massively exaggerated, with claims that the English were hugely outnumbered a lie. More controversially still, they will say that the foreign invaders used numerous underhand tactics against an honourable enemy. These included burning prisoners to death and setting 40 bloodthirsty royal bodyguards on to a single Gallic nobleman who had surrendered. 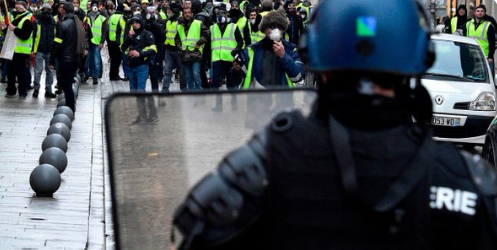 ‘There’s been a distortion of the facts and this conference will attempt to set the record straight,’ said Christophe Gilliot, a distinguished French historian who is director of the Medieval History Museum in Agincourt, where the conference will take place. ‘We have historians arriving from all over France, and all will produce hard facts concerning the battle, rather than rumours and speculation. It was on Friday October 25 1415 – St Crispin’s Day – that a force led by Henry V engaged the French at Agincourt, a small village not far from Calais in northern France. The English army, made up mainly of archers using longbows, massacred a vast force of noblemen in the most famous battle of the Hundred Years’ War. Immortalised by William Shakespeare in his play Henry V, Agincourt has since become a byword for English heroism in the face of apparently insurmountable odds. In fact, detailed bureaucratic records of French king Charles VI’s army reveal that they were made up of 9000 travelling soldiers, perhaps with another 3000 locals from the Picardy region where the battle took place. This compares to the total force of 12000 who travelled to France with Henry, although some 3000 were lost during the preceding siege of Harfleur, and through dysentery. 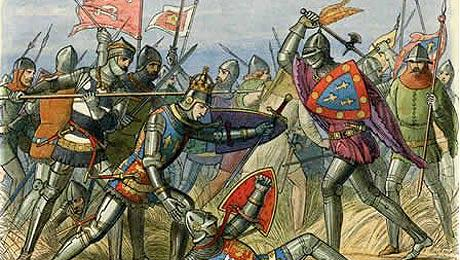 English chroniclers writing in the years following the battle have wrongly claimed that there were as many as 150,000 French, compared to 6000 odd English. Mr Gilliot said notably horrific acts perpetuated by the English included placing prisoners in a barn and setting in on fire, with the permission of Henry V.
When the Duke of Alençon, who commanded the second division of the French army, had failed to put an axe through Henry, he tried to surrender but was killed by the King’s 40-strong bodyguard. Mr Gilliot said: ‘There were numerous heroic acts by the French on the field of battle, but they were met with barbarism by the English.’ While, significantly, no English academics have been invited to today’s conference in France, the revisionist theories have found support on the other side of the Channel.